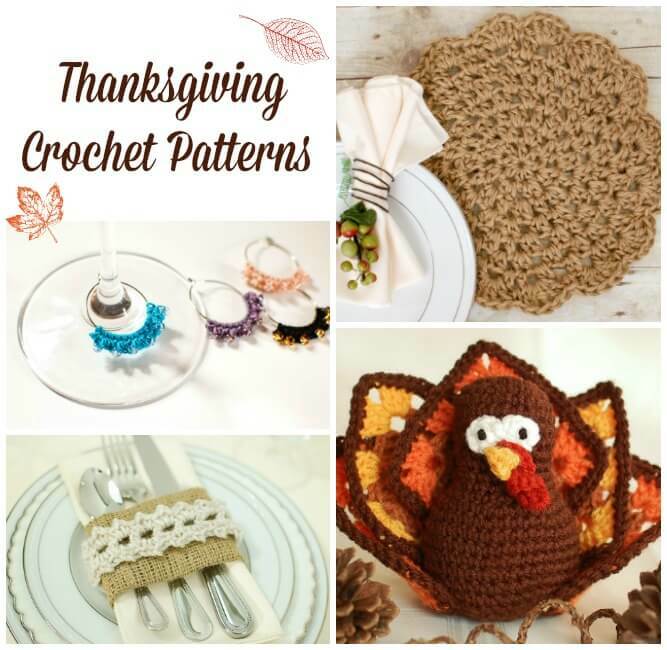 Whether you’re hosting or visiting this Thanksgiving, you’re sure to love these fun Thanksgiving crochet patterns to make for your home, your table, or your hosts! All the Thanksgiving crochet patterns and projects mentioned below are free … just click on the bolded text to go right to the free pattern or tutorial. My sweet amigurumi turkey, or Mr. Gobble as I like to call him, has made an appearance every year since I made him. The little ones always love him! As for me, I love his granny square wings. Set up a whole Thanksgiving table scape by adding little pumpkins and some needle felted leaves and acorns. The table is always the focal point of Thanksgiving. I love to decorate my table with a blend of cozy elegance and some rustic touches. These jute crochet place mats and burlap and lace napkin settings are my go to choices. And don’t forget a pretty table runner … I love the look of this Thanksgiving runner made by a reader (scroll to bottom of post to check it out). It’s always nice to bring a little something for your hosts to show your appreciation. These wine glass charms are so quick and easy and are always a hit. They are especially handy when trying to find which glass is yours. Pair a set with a nice bottle of wine and even stitch up this handmade felted wine tote to bring it in. And don’t forget about clean up … that duty is never fun. Crochet up a set of crochet dishcloths or some crochet trimmed tea towels to help make the job more enjoyable. Made one of these patterns? Show it off on Instagram and tag me @petalstopicots. Pssst … Christmas will be here before you know it so get a head start on some Christmas crafting with these free Christmas crochet ideas here. Are your patterns in U.S or U.K. terms?